I am adding a few pictures with 3 various problems. The spinach and collard in my vegetable garden has the same problem as I had last year. I have a box with very good organic soil. All my other vegetables are doing very well. Thanks for contacting the Toronto Master Gardeners. You mentioned more than one picture; we have received only one–is it of the collard greens or spinach? Although both spinach and collard greens are leafy vegetables, they belong to two different families of plants. Spinach belongs to the Amaranthaceae family (beets, Swiss chard) and collard greens belong to the Brassicaceae family (cabbage, kale, broccoli). Even though each are affected by some different pests and diseases, they do share some problems. Do you have more than one “box”? How big is your garden? Even though you may have good organic soil, some diseases will ‘contaminate’ the soil whether the soil is organic or not. There are other factors that you will need to keep in mind to minimize and prevent problems in your vegetable garden. 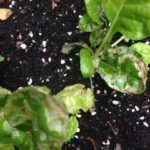 If the rest of your garden is doing very well, the problem seems to be specific to the spinach and collards. If you are unable to rotate your vegetables, you could look for fusarium-resistant cultivars of vegetables. Do you start your garden from seeds? Make sure that the plants aren’t growing too close together so that there is sufficient air circulation around the plants to minimize the problem in your garden. Also make sure that you remove the affected leaves from the plants and that your tools are clean. Dispose of the leaves into the garbage; do not add to any compost piles. At the end of the season, clean up all the plant material so that it doesn’t remain on the soil. We hope that your vegetable garden does well for the rest of the season. If you have any more questions, please do not hesitate to get in touch with us.